This guide is available to download as a free PDF. Download Dropbox Tips now. Feel free to copy and share this with your friends and family. Dropbox is an extremely popular, easy-to-use online file hosting and sharing service that was founded by two MIT graduates. It lets anyone easily backup important files and also synchronize those files across multiple computers as well as mobile devices. 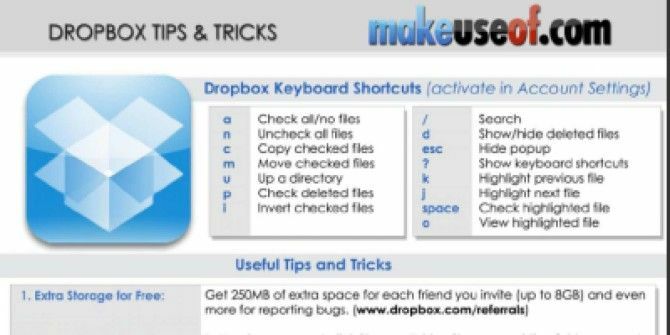 This cheat sheet outlines handy Dropbox keyboard shortcuts, some of its useful features and third-party websites whcih extend Dropbox uses further. Definitely a must-check for all Dropbox users. Explore more about: Cheat Sheet, Dropbox.